Next time someone talks about that confidence thing in motocross, reference Justin Barcia’s 2015 Red Bull RedBud National performance. Barcia’s season was on the rocks at one point, before he turned things around with improved rides early in Lucas Oil Pro Motocross. 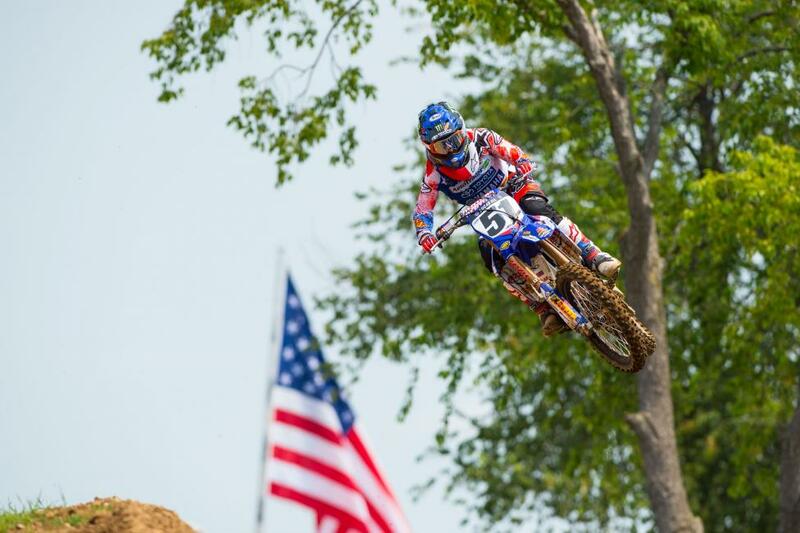 He didn’t appear a threat to win, though, until he pulled one out in a crazy, muddy Budds Creek National last weekend. Then, suddenly, with that confidence boost, he’s leaped to another level. He beat Ryan Dungey straight-up, in perfect conditions, to win his second-straight race. He talked about it in the post-race press conference. Racer X: Talk us through it. Obviously first moto you led for a bit, second moto you led again and held it all the way to the finish line. Justin Barcia: Yeah, for sure. First moto I had a good holeshot. Ryan [Dungey] closed in, made the pass, and I got back on him again. I wanted to get the position back and I got caught up in a little bit of lap traffic. But Ryan rode super good. He kind of pulled a little lead and I kind of just stayed where I was at and pushed through the whole moto. It was a good first moto. I was happy with it. Obviously you always want to win but second was just as good as a first in the first moto. Obviously a lot of confidence built in from last week. Did that feed into this week and how you performed as a rider? For sure. I talked to Jeff Stanton, my old trainer, this weekend and I was like, everyone’s going to say I just won because I’m good in the mud and I told him I wanted to back it up this weekend in the dry conditions. Somehow I was able to do that! It feels really good. The confidence is definitely high but it’s just like any normal week. You’ve got to train hard and do the same program and come in here wanting to do good. I struggled in practice pretty bad today. I think I had the whole team a little nervous. The first practice wasn’t the greatest. I was riding a little tight. The second practice I took a handlebar to my leg, [and it] swelled up pretty good. It seems like days like today you struggle a little bit but somehow you find a way to push through it and achieve what you want. That handlebar to the leg, I believe that was the left-hander after LaRocco’s Leap? Yeah that didn’t feel good at all. It’s still super swollen but not too bad. Second moto you were leading, you know you have Ryan Dungey behind you, mentally what were you going through, knowing he could capitalize on any mistake you made? Oh man, it was gnarly! I’ve got to be honest [about that]. The whole time I think the biggest lead I had was almost three seconds at one point. I think he made a mistake maybe at that point but it really was like a second the whole time, the whole race. I just had to stay on it, make the least mistakes. Ryan was good in the back section, I was good in the front section so it kept the race super close, super even. But it was unbelievable. It was for me just hammer it down and try to put in solid laps and keep the gap. Obviously I want the gap to get bigger so I can cruise the last couple laps but that didn’t happen. I asked this last week but it’s kind of the same thing. How hard has it been to rebuild yourself? You've been down for a little while, like a year ago at this time you were out with ankle surgery, and it’s been a long time to get back to your old level. How hard has it been to get to the level where now you can beat anyone straight up in all conditions? I’ve been through a lot for sure the past few years. Switching teams, injuries, injuries after injuries, stuff like that. But I’ve just kept motivated and put the right people behind me and made the right decisions and just trained through the hard times and never gave up. It’s paying off for sure right now but it’s definitely been a struggle. But I’m really happy the decisions I’ve made and the place where I’m at right now. Obviously two wins in a row is great. It’s not easy for sure. I know it’s not going to happen every weekend but we’re making up a lot of good points right now. Just pushing through it. Is this one almost bigger than last week because like you said, it was a mud and Dungey had crashed and all that? Yeah, for sure, this is a bigger win here. RedBud is certainly a challenging track. I can’t even tell you how many times I’ve crashed here super hard. Broke my nose here a couple times! This place is brutal. For how good my bike worked today and the way the team worked together and the way I rode from going from riding really bad in practice to riding super good in the motos, it’s pretty special for sure. 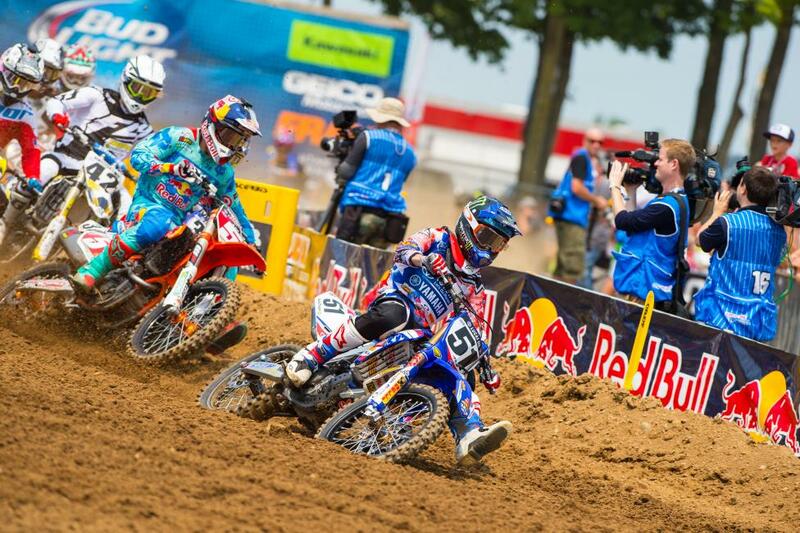 Talk a little more about having Dungey right behind you. I would say that was the hardest-earned win I’ve ever had for sure because Ryan was there. It was within a second pretty much every single lap. He closed in on me in the back sections, I pulled a little on the front sections. But it all evened out. I’m sure at the checkered flag it was within a second. I don’t know how I kept a straight head that whole race. The lappers were really bad today. I don’t know what was going on with that. Off LaRocco’s Leap they don’t move out of the way, they just doubled the middle. So I had to take a few risky chances on jumping the leap and I was pretty nervous about that but I made the right decisions, luckily. This track’s a hard track to win at. It’s certainly rough, one of the roughest ones so far. The bumps are super square-edged, but had the suspension dialed today and it was all good. Is it a coincidence that now that you’re riding better the starts have all of a sudden come back as well, or is that how this whole mental thing works? [Laughs] I have no idea how this whole thing works, to be quite honest with you! But definitely we found a really good motor package at Glen Helen. My chassis has been really good, my suspension’s been super good. It’s like you put all the little puzzle pieces together. There’s always things you can make better but we’ll keep working on that. Like I said, today was a really special day and we’re all super happy. Got to keep fighting for sure. We definitely want to be up here some more. Did you ever worry that you wouldn’t get back to this level? Did you worry at one point like, man, I don’t know if this is happening? Yeah, I’ve been beat down before for sure. I don’t know how many times I can keep getting hurt and doing this. But I’m still pretty young so I heal up pretty quick and I just keep fighting back. I don’t know what else I’d do besides ride dirt bikes. I really enjoy racing. It’s fun and especially days like today make it even better. Your season turned the corner rather quickly. Is there something you could point to from just even a couple rounds ago to now? We obviously wanted to win right away but kind of like I said, you’ve just got put all the little puzzle pieces together. I hired [riding coach] Buddy Antunez on probably like the third round of motocross so I would say that was a big help for sure. I’ve always been bad about not shifting my bike and revving the hell out of it. I still do that, like I said in practice today, that’s what I was doing, and the team was on me pretty good. You’ve got to shift that thing if you want to do good today, pretty much. Luckily I got the holeshot and just kind of rode how Buddy’s been telling me to ride, and second moto same thing. So I would say Buddy’s a big part. Off the track I’ve been training myself. I don’t have a trainer off the track anymore so I’d say that’s been good. I’ve been learning a lot. Me and my mechanic Ben ride bicycles, so that helps. A lot of little things have changed, not huge things, but I’d say it’s all coming together. It looked like you were having a lot of fun at Budds Creek. Has that fun kind of come back after Budds Creek and now carrying into RedBud? Yeah, for sure. Budds Creek was good. I like the mud. I had a big lead at Budds so I was able to have more fun doing whips off the singles and just fun stuff like that. Like I said, it brought me back to my amateur days riding in New York at some local tracks just having fun as a little kid. So that’s kind of how I felt last week. This week unfortunately practice didn’t go that good and I was a little down about it. I wasn’t too happy. I didn’t think the day would turn out like this but I just kept positive and got two holeshots, so that helps hugely. You’ve been coming on strong here as of late. A few months we’ll have Motocross of Nations. You look like you’d probably be a pretty good candidate for the MX3 spot there. What are your thoughts on potentially being chosen there? Would it be something you’d be interested in doing? Yeah. I did Motocross of Nations twice now and we haven’t won the overall so I would say I would definitely be interested in doing that, especially with the new team. We’ve never been as a team so that would be pretty special for us to get picked. But it’s a little ways out still. We’re just going to keep on plugging away, being consistent, and try and get some wins. But I’d like to go for sure if I’m healthy and we need to get that number one plate back for sure. We’ve got Millville coming up in a couple weeks. 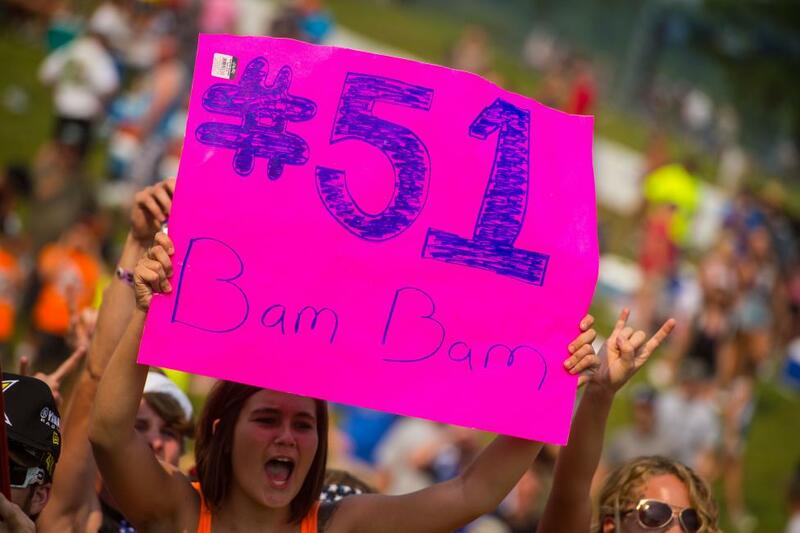 You think you can keep the ball rolling at Dungey’s hometown track? Yeah, I think we’ll definitely keep the ball rolling. Not saying we’re going to win them all but definitely want to be on the podium and fighting for wins. I’ve done good at Millville before in my GEICO days so that was good. He’ll be hard to beat there. He’ll have the hometown crowd and it’ll be challenging but it’s not just Dungey, you got Ken [Roczen] and his teammate and there’s my teammates, there are so many guys. It’s never easy. These things don’t come easy. Definitely be a tough, but I do enjoy that track. It’s pretty fun. It’s pretty open and our Yamaha is pretty fast so it’ll be good. It has been six years to the day today that JGR won its first overall here outdoors. So congratulations on adding to some moto history here at RedBud. Yeah, thanks, I appreciate it. The whole team’s been working super hard and it’s finally paying off. Everyone’s extremely happy. The fans here today were pretty unbelievable. That guy with the shaved chest #51, that was pretty intense. You can’t beat this place. It’s awesome!